Metawatch Canada continues to Offer industry first(s) by exceeding price discounts for average Aftermarket Desktop Ink Cartridge Prices. Across all vendors, Metawatch Inkjet still supplies some of the lowest cost product to the market and has been able to maintain Quality and reliability levels exceeding 99.9%. Which cartridges are cheaper, Canon or Epson ? Well it’s a good question ? Why you ask ? Both Epson and Canon use approx 17 ml/cartridge with a few exceptions, on their mid of the line models. 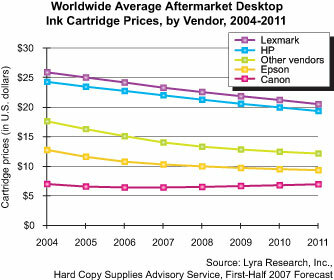 With all things being equal, (being different print technologies) the only real differentiator is the cost of the cartridges. Using Metawatch Inkjet Supplies as a comparision, you can purchase the Canon BCI 6 series cartridges at a lower unti cost than that of the T048 or T044 series of Epson Cartridges. So if price is your only concern then go Canon. Oops, oh yea, Epson tends to have a higher printer resolution than Canon printers….. In the end it comes down to your personal choice.